PHILOSOPHY: HOW IS DR. KOLSTAD DIFFERENT? Many of our Asian patients are not looking to make a large dorsal hump smaller, but instead are seeking to augment a diminutive nasal bridge. They are seeking refinement of the nasal tip, without it looking too narrow. Above all, they seek to retain the features unique to their ethnicity. The goal of Asian rhinoplasty is simple: to enhance one’s natural features and refine the others in a way that balances the nose in harmony with the rest of the face. Achieving this goal is best performed by the hands of a specialist. 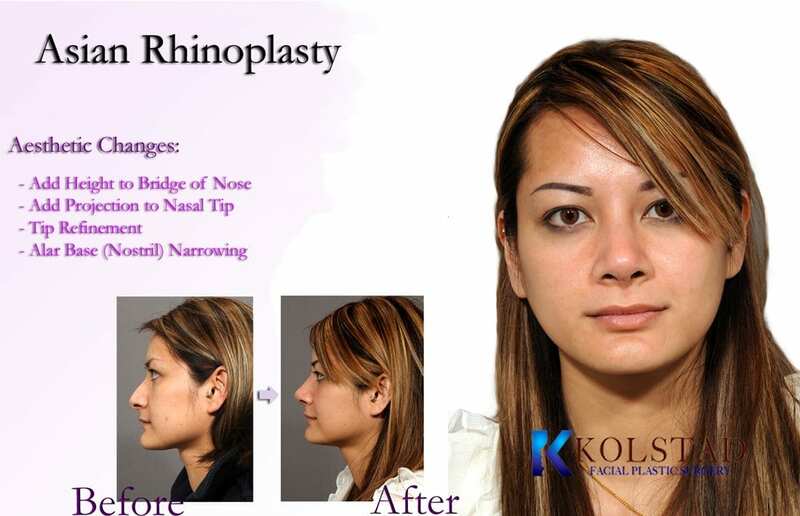 Why do you need a rhinoplasty specialist? 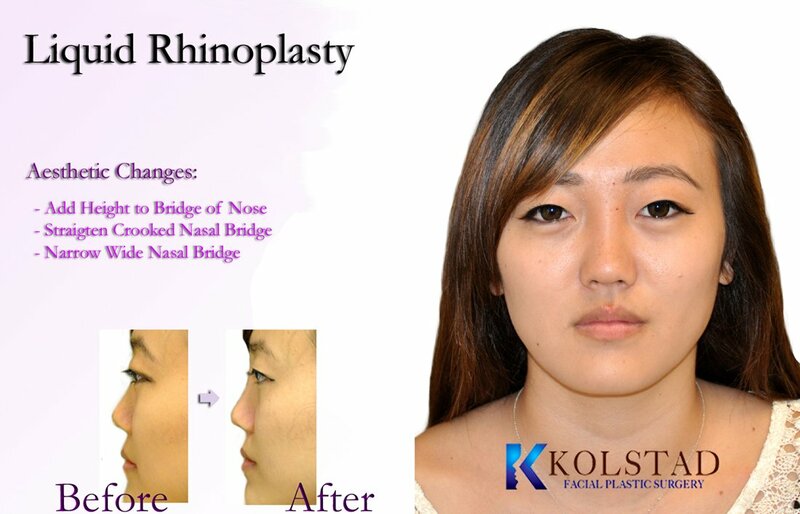 Rhinoplasty is perhaps the most difficult operation to perform in facial plastic surgery. One to two millimeters can be all that separates perfection from unacceptable. What may appear to be an easy change, for example reducing a prominent dorsal hump, will alter the appearance of the entire nose and the way the nose interacts with the face. In short, rhinoplasty surgery is complicated. Without question, rhinoplasty requires a surgeon who specializes in plastic surgery of the face. Dr. Kolstad will not take any shortcuts during your surgery, spending an average 3-3.5 hours making sure that your nose will look and function at its best. Dr. Kolstad’s analytic approach distinguishes him from his colleagues. He believes in a customized approach that is specific to the way that your nose will harmonize with your face. Dr. Kolstad learned his technique from one of the best rhinoplasty surgeons in the world. He spent an entire year in New York working exclusively with one of the world’s premier Facial Plastic Surgeons. He will illustrate his surgical goals and direction using state-of-the-art computer imaging software. During the image enhancement session, you will have the opportunity to express your likes and dislikes about the shape of your nose. Your aesthetic goals will be incorporated into the image enhancement. You will have the final say in determining if this is the right nose for you. How different will you look? Remember, if it doesn’t look natural, it doesn’t look good. Dr. Kolstad’s goal is for you to enjoy the new shape and contours of your nose in the mirror and in photographs. Your friends and colleagues should compliment you on the shape of your nose without ever recognizing that it was done. Look around, there are no pinched nasal tips on this site! Dr. Kolstad prefers an open approach to the nasal framework. With this technique, incisions are primarily located inside of your nostrils, with only a small incision placed across the columellar skin, the vertical strip of tissue between your nostrils. When sutured together properly, this incision heals so well that only you and your facial plastic surgeon should know its there. The open approach allows for a direct view of the nasal structures leading to a more predictable result. Dr. Kolstad will use cartilage from your septum, (possibly ear or rib in revision cases) to enhance the definition of your nose and to provide support. You can choose to reduce or increase the size of your nose, change the tip or the bridge, narrow the span of the nostrils or change the angle between your nose and your upper lip. Dr. Kolstad will evaluate the structure of your nose in relation to the shape of your face, the thickness of your skin, your height and your age. He will work with you to try to make your nose complement your other facial features. Nonsurgical rhinoplasty is a procedure performed in the office to increase the size of a nasal bridge or soften a nasal hump. This procedure is most often sought by Asian and African American patients looking to add volume and definition to the part of the nose that rests between the eyes. Adding volume to a diminutive nasal bridge can have a dramatic impact on the entire face. Injectable rhinoplasty is most noticeable on profile view. Nonsurgical rhinoplasty can soften a nasal hump or add volume to a small nasal bridge. Typically injectable fillers such as Juvederm, Restylane or Radiesse are expertly placed into the nasal bridge. The results can last up to a year depending on the amount and product used. Dr. Kolstad can frequently illustrate potential changes using computer-enhancement software before you have to decide if it is the right look for you. The rhinoplasty cast will stay on for one week. After removal of the splint, your nose will be a little swollen and “puffy”. However, even when swollen, your nose will look better than it did before surgery. HOW LONG DOES IT TAKE FOR THE SWELLING TO GO AWAY? It takes two to three weeks for the majority of swelling to be reabsorbed from your nose. As the swelling is removed, your nose will become more contoured and the definition will enhance. WILL I GET BRUISES UNDER MY EYES? It is common for some bruising under your eyes. With frequent use of ice packs the bruising is typically minimal and does not bother the majority of people. Dr. Kolstad recommends that his patients obtain cover-up make-up prior to surgery to help camouflage any postoperative bruising. HOW LONG DOES IT TAKE FOR ALL OF THE EDEMA TO GO AWAY? It takes a full 12 months for 100% of the swelling to be completely gone. The nasal skin must shrink-wrap to the new framework and definition. This takes time. Throughout the postoperative period, Dr. Kolstad will use medicines to contour the nasal skin and enhance your result. WILL I HAVE A “PLASTIC LOOK” AFTER SURGERY? A frequent concern of our patients is looking plastic after rhinoplasty. There are limitless examples of unnatural, operated results. When surgeons remove too much structure, the nasal tip can look overly narrow. It is very important to choose a plastic surgeon that specializes in operating on the face. Dr. Kolstad is an expert in nasal cosmetic surgery and is known as the face specialist, because put simply, that is all he does. To schedule an appointment call us at (858) 859-2563 or get in touch with the form below.